Anyways….Our living room is quite unique. The walls and ceiling are a dark, dark redwood and there are only two windows in the whole room. To some, it may evoke a sense of a homey cabin, but to me it’s more like a cave. To say the least, it’s a challenge to light and decorate. There is one overhead light and then we’ve attempted to add lamps around the room, but something was missing. Maybe I’ve been watching too many DIY shows, but I had been itching to break out a can of spray paint. Right after I saw those awkward babies and said hello to the cat, I came across the gaudiest, brassiest lamp you’ve ever seen. Straight out of an 80’s hotel- including a nasty stained and disintegrating shade. BUT, it had a fantastic shape, the electrical worked, and I could see potential in it (as well as my reflection). I snatched that sucker up for a whopping price of $8.00! I figured that even if my attempt miserably failed, it was worth a try. 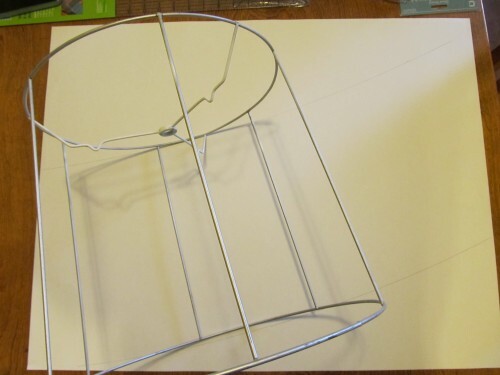 After a trip to Home Depot and the craft store, I was ready to start on my project! 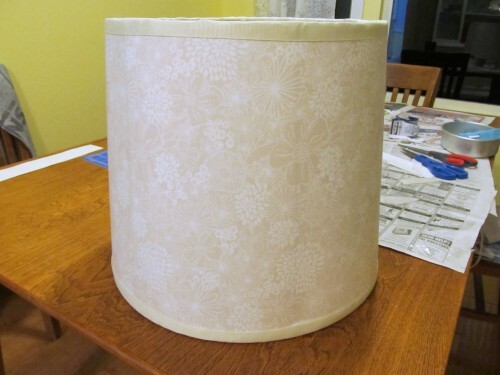 I chose a simple white satin Rust-Oleum spray paint and a fabric with a subtle floral print. 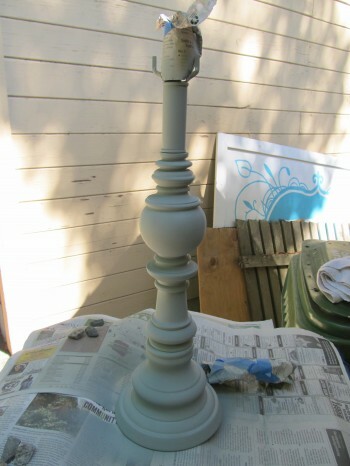 When I got home, I realized that I didn’t think about priming the metal before I painted it. Whoops! Thankfully, the hubs had me covered. 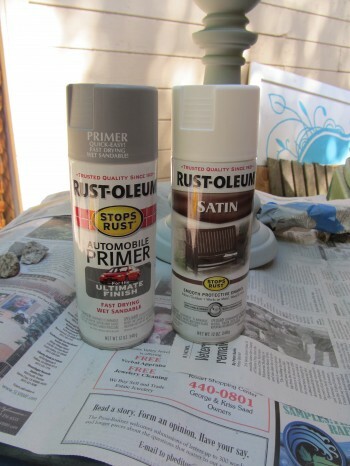 He pulled out his secret stash of spray paint and found a grey metal primer that he used when he was restoring his ’54 Chevy. Although it says it’s for automobiles, it worked perfectly fine for this project! 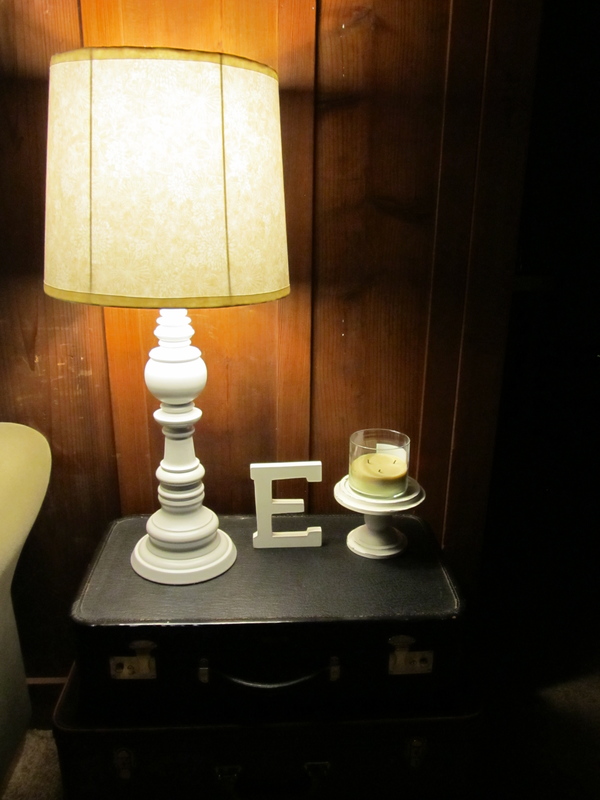 Before I painted the lamp, I used steel wool to clean away the years and years of who-knows-what. A final wipe with a rag and I was ready to paint! 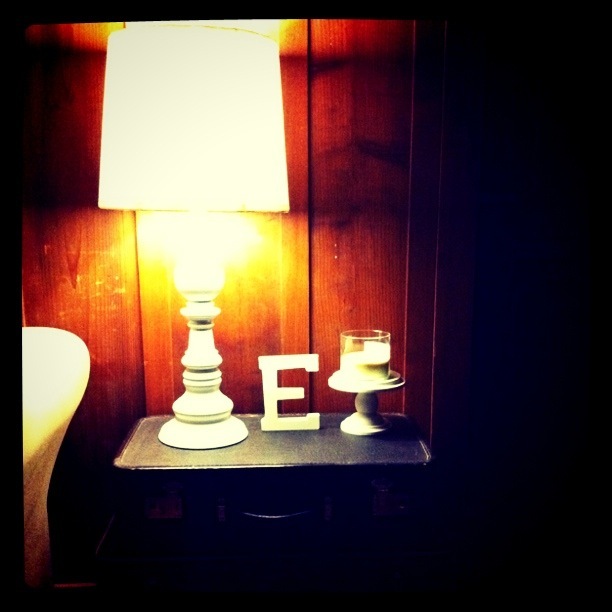 **not pictured is the lamp-harp, nut and the top of the shade- which I painted white as well. Definition of a lamp-harp: the metal wire lamp part that typically mounts below the lamp socket and supports your lamp shade. I had NO idea what the heck that thing was called, thanks Google! Already looking a million times better, right?! 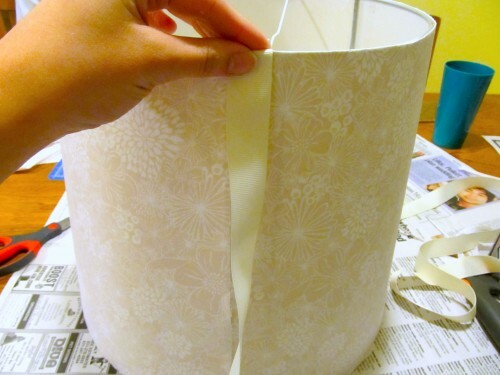 While the paint was drying on the base of the lamp, I pulled off the fabric on the old shade. 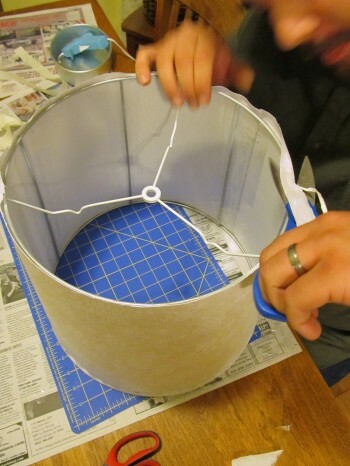 Underneath the gross fabric, I found a metal frame as the guts of the lampshade. 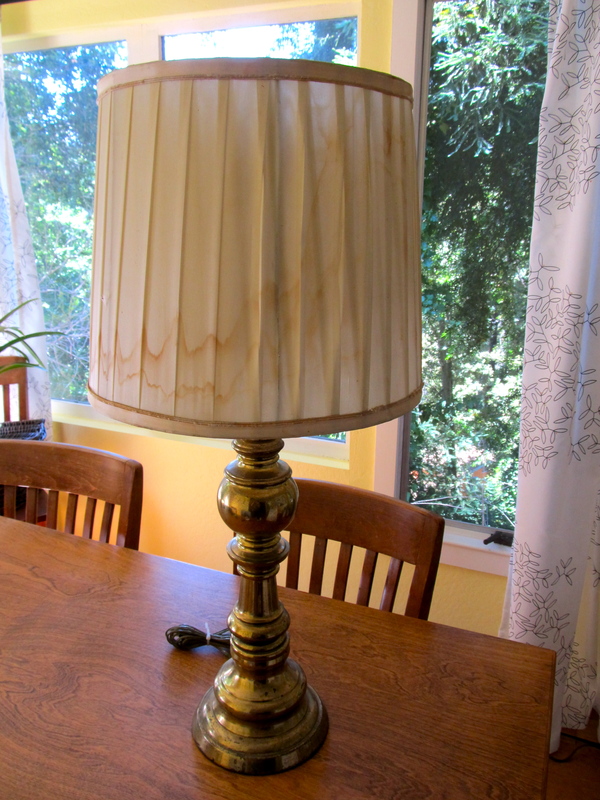 The old shade was basically 2-inch ribbon wrapped vertically around the frame. I had originally thought that I’d do the same thing, but with my new fabric. But when I started pulling the old stuff off, I realized I would need WAY more fabric than I had if I wanted replicate it (the frame is 12″ tall). 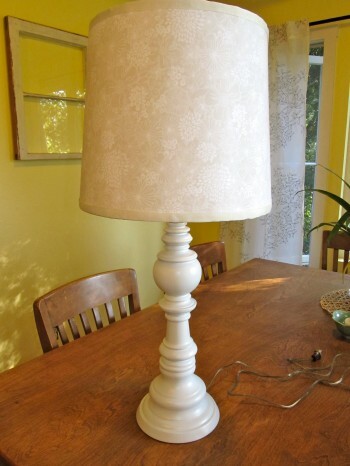 On to plan B. I looked at the shade on one of our other lamps and realized that I could totally re-create it with some poster board and spray adhesive. Whoo hoo! 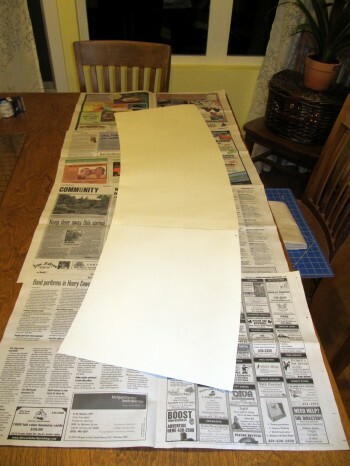 I traced the outline onto the board and cut it out. 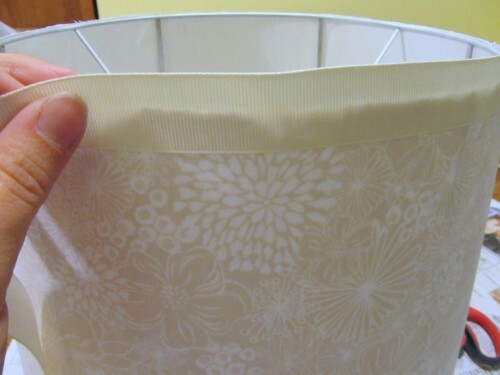 I actually had to use 2 pieces because the circumference of the shade was larger than one single piece. Lining them up and taping them together with wide packing tape solved that problem! Because the frame is smaller on the top than it is on the bottom, the poster board ended up being curved. 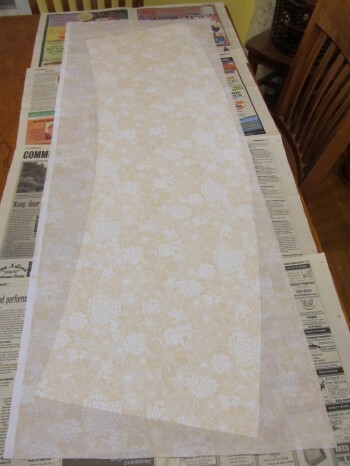 I then sprayed the poster board with adhesive and smoothed my fabric down, trying to avoid bumps or wrinkles. Hubby then helped me wrap the new shade around the frame and tape it down. His extra hands made this much, much easier! When we wrapped the shade, we made sure to line the bottom of the poster board/fabric up pretty well with the frame, so all of the excess needed to be trimmed off the top. Josh threw in a helping hand with this, too! 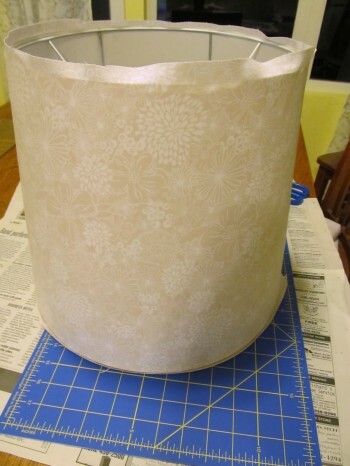 After the top was trimmed up, I hot glued cream colored grosgrain ribbon to cover the seams. Here’s a look inside the shade. 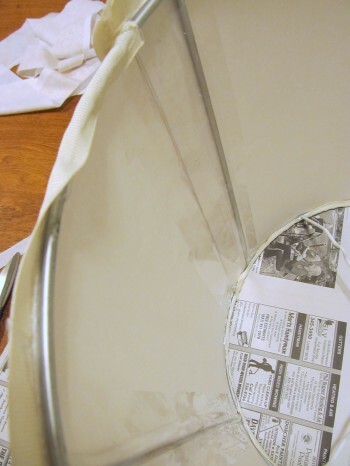 You can see that I attached the shade to the frame by using clear packing tape over the frame. It’s definitely not ideal, but it works. I wish that I had covered up the metal from on the inside, but I’m not sure how I’d do that. The only way you’re able to see the tape and metal supports is if you look straight down from the top of the light…I doubt that many of my guests are going to inspect my work that closely! Here’s a look at the finished shade! The next day, I sprayed the lamp with another coat of white and impatiently waited for it to dry. After a few hours of the waiting game *drumroll please*…Here’s the final product! This just makes me so happy! It adds a ton more light into the room and gives me the satisfaction of creating something awesome. The shade has subtle detail, but enough to catch your eye. One thing that I wish was different was that you can see the supports of the metal frame through the shade when the light is on. It’s definitely not the end of the world and most won’t even notice, but I do. Oh well…maybe someday a different shade will find its way to this lamp :) For now, it does the job well! 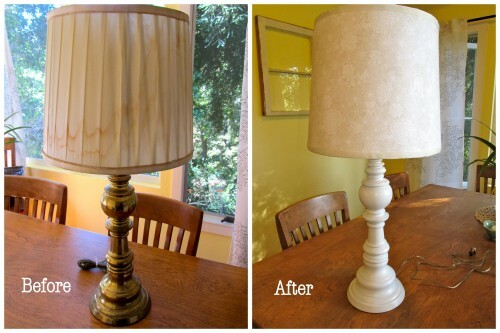 Pretty good for my first lamp re-do, I’d say! I am so impressed! It looks adorable! 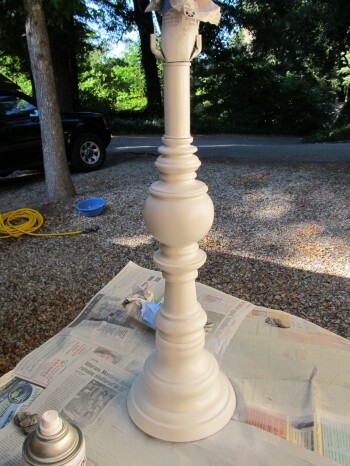 You just motivated me to finally start on my two DIY projects that I have been putting off–revamping my grandma’s buffet and making a bench out of a table we got for free from an old neighbor! Yay diy! 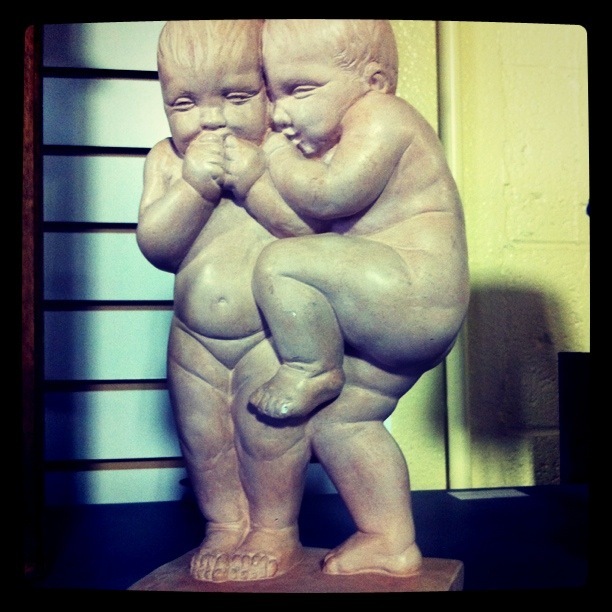 Have you seen picker sisters on Lifetime? Watch it! Ooooh!!! Primer!!! That’s where I’ve gone wrong in the past! Great little post, thank you! We have a standing lamp that needs some definite lovin’ and I am TOTALLY doing this. Thanks for the inspiration!